Drifting away | What Car? What follows is one of the most incredible days of driving any of us can remember. 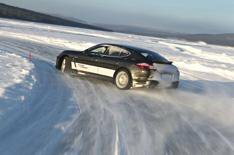 We start off in the rear-wheel-drive Panamera S, and we're taken to a basic slalom course that is made up of three simple turns and a big 180-degree turn at the end. It gives you an idea of what the cars will behave like, and it gives the instructors a chance to assess your level of competence. It's already amazing how much grip the tyres offer on sheet ice, so much so that after doing the exercise a few times we're starting to get the car dancing between the turns. All the while Tobias is talking to us through the walkie-talkie in the car, cajoling and offering advice on what we can be doing better. We move on to the more advanced slalom, still in the Panamera S. Essentially, it's a large loop, but with left and right turns of varying severity all the way round. It's much easier to get a rhythm going on this, and within a few laps we're Scandinavian flicking this way and that and genuinely drifting! Sometimes for yards at a time. It's all very 'yeeha'. Or should that be Juha?